Symbolizing man’s ability to spiritually rise up out of the muck, no matter how deep it might be, the flowers of the lotus plant look like jewels dancing over a sea of sprawling, gently green leaves. I’ve heard it said that there is an audible popping noise when the petals open in the morning, but numerous failed attempts at actually hearing this sound have got me thinking that that is just an urban legend. Anyway, if you live in Tsukuba or Ibaraki it would be a shame if you didn’t take a drive down to Kasumigaura for some lotus viewing, as this prefecture is the nation’s largest grower. Lotus flowers are often linked to mid-summer in the Japanese psyche, but lotus root farmers have been experimenting with different later-blooming varieties making it now possible to enjoy these remarkably beautiful and culturally significant flowers in the cooler autumn air. 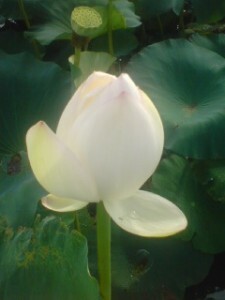 According to the ancient chronicles of this area (Hitachi no Kuni Fudoki), a type of lotus was cultivated in ancient Ibaraki for medicinal purposes. Later, different varieties were introduced from China, with today’s most common types of lotus having been introduced from the continent during the Meiji Period (1868-1912). There is an interesting etymology for the Japanese word for this plant, which is HASU (蓮). After the hasu’s flowers fall away, a hard honeycomb-shaped pod remains standing. Since this looks like a bee-hive (hachi no su, in Japanese), the entire plant is referred to with an abbreviated form of this, which is HA SU. Besides the word hasu no hana (蓮の花), which is often used for the lotus flower itself, there is another expression used more often as Buddhist terminology: renge (蓮華). When you eat at a Chinese restaurant or ramen shop in Japan, you are given a thick curvy spoon which reminds the Japanese of the petals of the lotus flower. That is why these spoons are called CHIRI RENGE (literally, fallen lotus petals) in Japanese (though NOT in Chinese). In Asian countries, especially India and China, every part of the lotus plant is eaten. In Japan the crunchy and beautiful roots are a very common ingredient, and the lotus seeds are made into sweets (though not very commonly eaten). 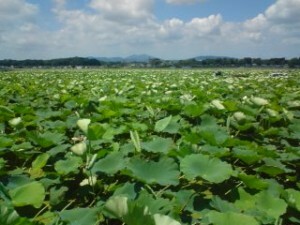 As mentioned above, Ibaraki Prefecture is the number one producer at present, with much of the area around Lake Kasumigaura turned into lotus ponds. 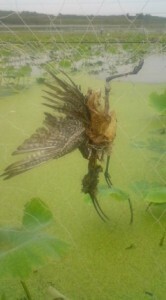 The use of nets, ostensibly to protect these fields, trap numerous birds which can make touring around the lake highly stressful. 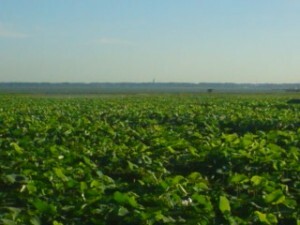 However, in this season, while the fields are full of greenery and the number of birds low in general (before the autumn migration), you are unlikely to find any trapped birds (the nets are also slowly coming down, the funding for them STOPPED, thanks to the efforts of the Kasumigaura Bird Rescue volunteers). One of the nearer places for lotus viewing is across from Red Lobster (I mean on the other side of Tsuchiura Gakuen line). I park at the used car dealer’s lot. Look out for lots of waterbirds (there are no nets here). Lotus fieds in Kasumigaura-City ( July 2010) Can you make out the just visible form of the Ushiku Daibutsu (Great Buddha) across the lake? 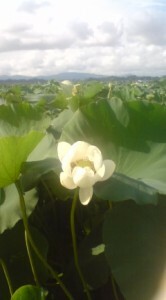 For a journey into deep lotus land, you have to drive to Tsuchiura. Take the upper road over the city which takes you to the East side of the station.Turn left at the light and go straight until you see lotus fields on both sides of the road. When you reach a T-junction turn right and then make a left at the next traffic light (with the great tofu shop, TOFU-YA, 十二屋 , at the corner). Now you can enter the LOTUS WORLD of the Tamura (田村) and Okijuku (沖宿）. Have a nice drive. I guarantee it will be an enlightening experience. Besides lots o’ lotuses, one thing you will notice is the ironically plastic lotuses around grave yards, left over after the O-Bon Festival ( which is in mid-August in Tsukuba).